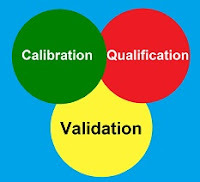 Definition of Calibration, Qualification and Validation, Qualification and calibration are the important parts of Validation. A lot of pharmaceutical professionals are having a big confusion among calibration, validation and qualification, hence I am trying to wash out the confusion. I think it will make a clear image of these three concepts and their definitions. The set of operations that establish, under specified conditions, the relationship between values indicated by an instrument or system for measuring (for example, weight, temperature and pH), recording, and controlling, or the values represented by a material measure, and the corresponding is known values of a reference standard. Limits for acceptance of the results of measuring should be established. Always remember any reference standard is always used in calibration. The action of proving and documenting that any process, procedure or method actually and consistently leads to the expected results. It can better understand that the validation is a documented evidence to and done to prove the consistency of the expected results of any process, procedure or method. The action of proving and documenting that any premises, systems and equipment are properly installed, and/or work correctly and lead to the expected results. Qualification is often a part (the initial stage) of validation, but the individual qualification steps alone do not constitute process validation. Qualification is a part of validation. Your updates are good keep it up. Thank you so much sir.. Your information is very helpful..
What is the difference among calibration, performance check and operational check? definitions are easy to understand, thank your informs!